Momma Jorje: eBundle Sale Ends Today! The Mindful Parenting eBundle Sale ends TODAY!!!! This is your LAST CHANCE to get 22 quality parenting e-products for only $24.95 USD! Be quick to get your copy of this bundle! Relaxation Meditation (audio) — Amy Phoenix — lifetime access!! 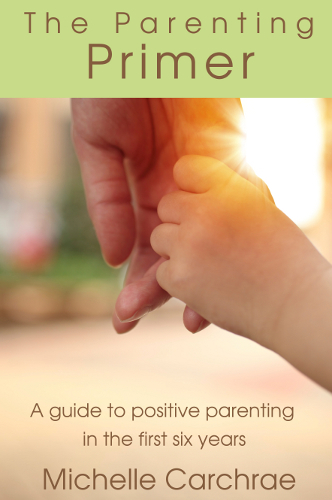 The Newbie’s Guide to Positive Parenting is an introduction to the philosophy of positive parenting. 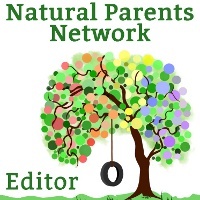 It addresses what positive parenting is, and what it is not (permissive parenting). It discusses how to change your mindset from the traditional paradigm of control and fear to the positive parenting paradigm of connection and love. It gives you teaching tools and discusses the differences between consequences, punishments, and problem-solving. Finally, it goes over enforcing limits without punishments and 10 alternatives to punishments as well as 10 things that are more important than discipline. Bursting with ideas for playing inside and outside, with activities for moving, talking, cooking, creating, thinking, singing, imagining and constructing, Play Grow Learn is a downloadable e-zine that provides both inspiration and information for parents and educators of children from birth to 5 years. When you're at your wits end and need to rest and recuperate, this CD is a fantastic resource ~ Grab yourself fifteen minutes or so, choose your track and let Genevieve’s calming voice and supportive words guide you back to your self … back to your centre … back to balance … back to you at your best … back to peaceful parenting! Play was born out of the everyday conversations of two stay-at-home Moms (with children under the age of 5) looking to find learning opportunities for their children, imaginative ways for them to explore art and media, novel ideas for play, ways to connect with them on a deeper level throughout the day, and the list goes on and on. This e-Workshop will be a way that we can continue that conversation with you. One of the moms will be Gina from Connecting Family and Seoul, and the other is her dear blogging friend, Kat, from Creative Playhouse. Mindset for Moms: From Mundane to Marvelous Thinking in Just 30 Days is a guide for better thinking and increased happiness in parenting and in life. Lessons about positivity that took Jamie years to learn, you can learn in days–30 days, to be exact. A compilation of her best-loved posts on motherhood from her popular blog, Dreaming Aloud, columns from JUNO magazine and many new pieces, never before published. According to one reader, “This book puts the mother, back in motherhood”. “It is no ordinary parenting book” but full of her trademark searing honesty and raw emotions. It will make you laugh, cry and feel deeply accepted – wherever on your mothering journey you may be. Nurturing Creativity: A Guide for Busy Moms is a book to help you grow creatively.Nurturing Creativity is about embracing the seasons of motherhood and appreciating where you are while helping you to make creativity a priority in your life. Parenting for Social Change: Transform Childhood, Transform the World (Social Change Press) is a powerful parenting book that isn’t about children, but about the harmful cultural messages we, as parents, perpetuate in our relationships with children. It addresses the work we as parents must do to free ourselves, the children who share our lives, and our world from those harmful messages. Covers everything from: how your experience with food affects your children and how to change that, how to meet the varying needs and tastes of the whole family without feeling like a "short order cook," as well as tips, ideas, strategies, recipes, and more from me and other mindful mamas. Remember "The Talk" you received from your Mom, or your school’s nurse? Remember how awkward you felt listening? Wonder how you can do a better job with your girl? If you would you like to feel relaxed, confident, and at ease when speaking with your girl about becoming a woman - this is for you! You will experience a sense of CALM and PEACE within yourself; An INNER EASE about the girl YOU once were; A DEEPER UNDERSTANDING of what your girl is feeling; SELF-TRUST going into any conversation with your girl; And a growing EASE in your relationship with her. The Parenting Primer is a guide to the main ideas and strategies used in gentle discipline. It will show you how attachment works to create harmony in families, empowering you to parent in a positive, creative way. "I love your sense of urgency on this issue – the way you talk about reaching out and getting the community you deserve. Too many times, women end up doing it all and struggling in silence. So many moms can “keep it together” but that’s not the way to live. They deserve more help and more support." 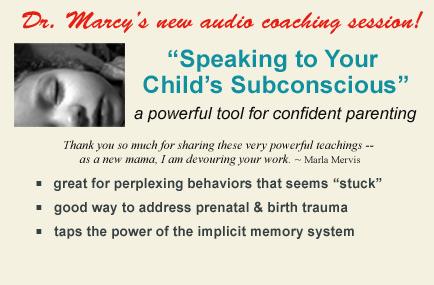 This set includes the Dr. Marcy Audio Coaching Session "Speaking to Your Child's Subconscious" and companion eBooklet, A Unique 7-Step Parenting Tool: Sleep Talking. Throughout my recent talks all over the world, what were SO many people interested in learning about? After hearing about the power of prenatal imprints, they wanted to know what parents could do when things didn't go so smoothly in pregnancy, birth or around conception. I make it clear that repair & healing are ALWAYS possible at ANY age, and mentioned an somewhat out-of-the-box approach I've developed over my years of coaching parents -- which includes talking to your child in his or her sleep. This 57-page eBook takes mothers through 20 small steps designed to help them become more mindful mothers. Follow along with Jennifer's journey as you begin your own. The Mindful Mothering Challenge will awaken your mothering, push you beyond your comfort zone, and deepen your connection with your children. With each sale, I earn an affiliate fee on this bundle. Buying this bundle supports my family and all the hard work I put into this blog. Get it NOW!